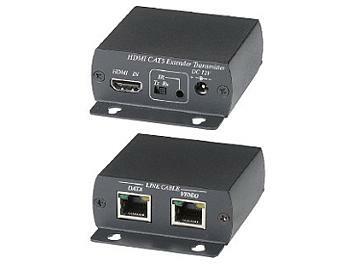 Extends HDMI & IR signal over two CAT5/5e/6 cables. External power supply requested with transmitter unit only, no power required at receiver (monitor) side. Built in IR signal, IR control could be selectable at either TX/RX side. Transmission range up to 60 m (196 ft) at 1080i, 50 m (164 ft) at 1080p resolution. HDMI 1.3 compliant, DDC, DTS-HD, Dolby.